Robotic Arms Controlled By Your….. Feet? The days of the third hand’s dominance of workshops the world over is soon coming to an end. For those moments when only a third hand is not enough, a fourth is there to save the day. Dubbed MetaLimbs and developed by a team from the [Inami Hiyama Laboratory] at the University of Tokyo and the [Graduate School of Media Design] at Keio University, the device is designed to be worn while sitting — strapped to your back like a knapsack — but use while standing stationary is possible, if perhaps a little un-intuitive. Basic motion is controlled by the position of the leg — specifically, sensors attached to the foot and knee — and flexing one’s toes actuates the robotic hand’s fingers. There’s even some haptic feedback built-in to assist anyone who isn’t used to using their legs as arms. The team touts the option of customizeable hands, though a soldering iron attachment may not be as precise as needed at this stage. Still, it would be nice to be able to chug your coffee without interrupting your work. Whether you have shaky hands when working on tiny components, or just need more control and flexibility, we think this “third hand” gripper using coolant hose is an ingenious solution compared to the little metal ones you can buy. Not surprisingly this isn’t an original idea. In fact, Sparkfun actually sells it as a kit. That being said… it’s rather expensive — especially when you can build [Frank Zhao’s] version for less than $15. He’s using a cutting board, three machinery style coolant hoses, and a handful of fasteners from the hardware store. You can use the accessories from a regular metal third hand, but [Frank] also shows us how to recreate them using a few washers, some steel strapping, and a wing nut and bolt. [Mr. Zhao] is no stranger to Hack a Day either — we’d almost call him an inadvertent contributor we’ve shared so many of his hacks! Just take a look at his tiny USB business card, his awesome LED pocket watch, a detailed reflow oven build, or even his IR based augmented reality setup. Admittedly this post is flirting with flamebait, but we think the concept of using a spring clamp as an iPhone tripod mount has a lot of hacking potential. Hear us out, and if we havn’t made our case you can rant about it in the comments. [Joe] wanted an easy way to mount his iPhone on a standard tripod. We’ve seen some creative solutions for this, like using Sugru to make a removable bracket. But he went a different route, using a cheap spring clamp to grip the phone body. 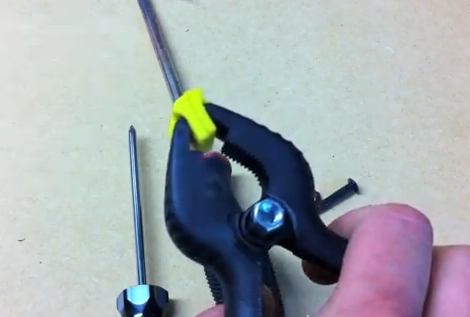 These plastic clamps are like over-powered clothespins, and use a screw as the pivot point. [Joe] replaced the stock screw with a longer one, then used a coupling nut which will attach to the tripod. A bit of foam on the pads of the clamp protect your device from the plastic teeth. It’s a fine solution (if you don’t mind putting that pressure on your smart phone). But we think this would be a great way to build your own heavy-duty third hand. It would be right at home with this modular solder platform. See [Joe’s] how-to video embedded after the break. [Patenomics] has had some trouble finding a suitable place to work on projects in his tiny apartment. 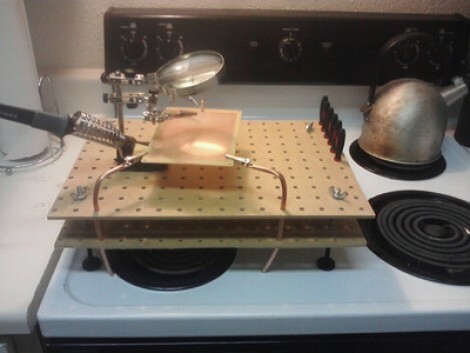 Lately he’s taken to using the stove top as a soldering platform and was looking for ways to protect the stove while adding functionality. He built this soldering platform from a couple chunks of pegboard and some hardware store parts. He’s in for under $15 and has a really functional platform that may be worth adding to your solder station. The two pegboard pieces are held in place by threaded rod and some nuts. This hardware also lends itself to adjustable feet so that you can make the platform level and stable. The holes in the top and bottom sheets line up to receive and securely position some additional tools. Here you can see that bendable copper pipe keeps some alligator clips right where they’re needed, but future plans include adding lights, clamps, and lasers. This makes a nice work platform to go along with your other portable electronic bench tools. But if you’ve really got the itch, you’ll eventually outgrow all of this and then it might be time to find yourself a hackerspace to join.